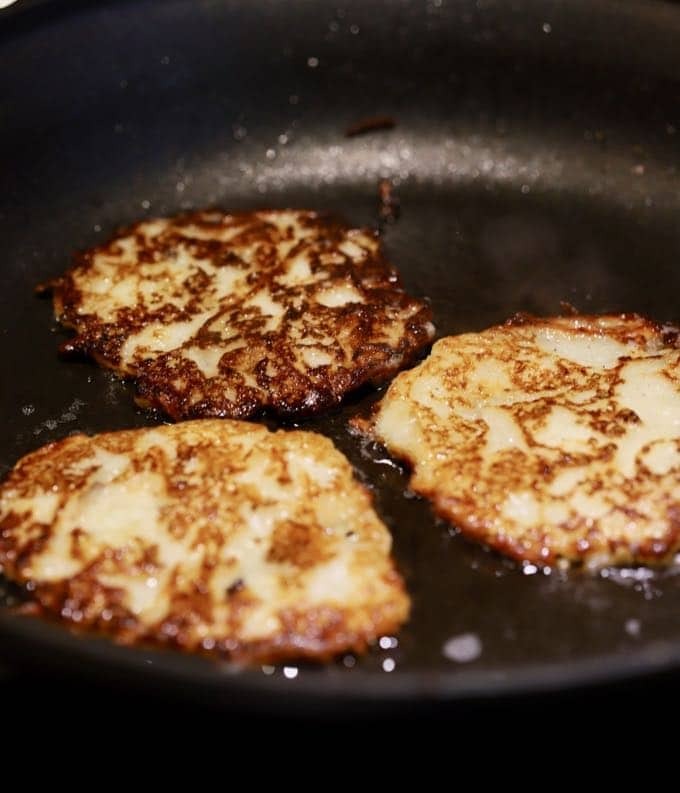 Traditional Irish Potato Boxty are delicious potato pancakes, crispy on the outside and soft and fluffy on the inside. They are made with a combination of mashed potatoes and raw grated potatoes mixed with flour, baking powder, milk, and egg. Irish Potato Boxty should be served hot. Not only are they very flavorful, but they are also quite versatile as well. They can be served at breakfast with butter, as a side dish for dinner, or as a savory appetizer with sour cream and chives. 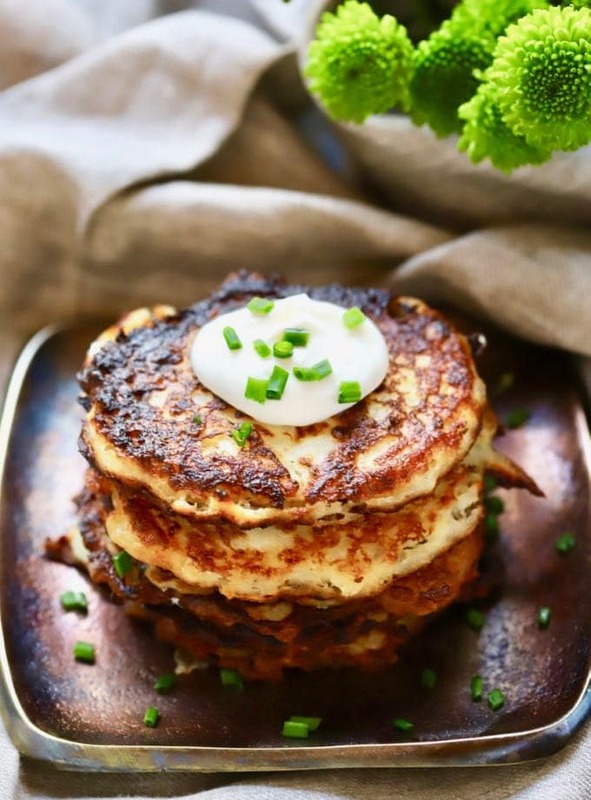 My sister, Chula over at the Pudge Factor Blog, shared this yummy recipe for Traditional Irish Potato Boxty with me, and I wanted to share it with you because I knew you would love them too! If you are looking for other traditional or Irish inspired recipes for dinner or a St. Patrick’s Day party, you might also like these recipes: Traditional Irish Soda Bread, Traditional Irish Potato Soup, and Corned Beef and Cabbage Egg Rolls. Need even more options for St. Patricks’s Day? Check out my roundup: Ten Irish Recipes for St. Patrick’s Day, or 18 Incredible Irish Recipes for St. Patrick’s Day from the Pudge Factor Blog. 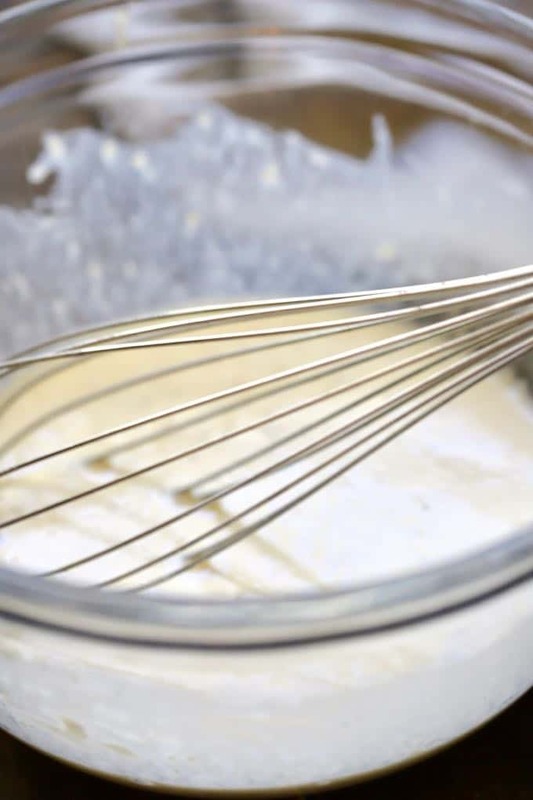 To make the Sour Cream and Chives Topping whisk together the sour cream and chives in a small bowl. Set aside. To make the Boxty, preheat the oven to 200° F. Put a wire rack on a baking sheet. Set aside. 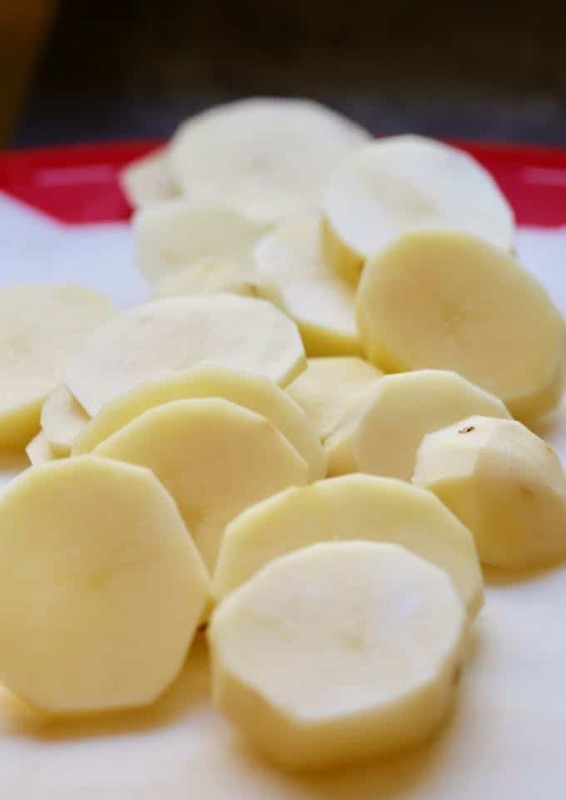 Cut half of the potatoes into slices, place in a medium saucepan. Add 1/2 tablespoon salt, and cover with water. Bring to a boil over high heat, reduce the heat to low and simmer, uncovered, until the potatoes are fork-tender, about 10 minutes. 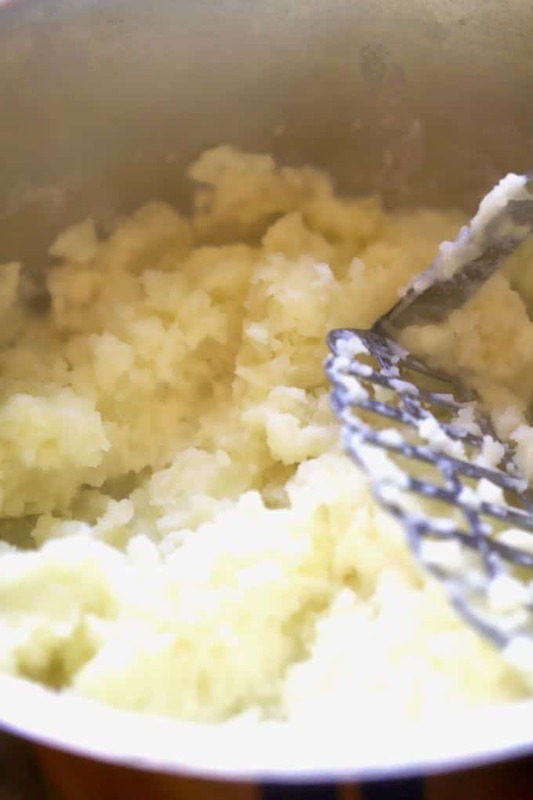 While the potatoes for the mashed potatoes are cooking, grate the remaining potatoes using a food processor or the large holes of a box grater. Transfer the grated potatoes to wire strainer set over a bowl. Toss with 1/4 teaspoon of salt and squeeze by hand to remove as much liquid as possible. Wrap grated potatoes in a clean dish towel and squeeze to remove any additional liquid. Whisk together the flour, baking powder, 1 teaspoon salt, and 1/8 teaspoon pepper in a large bowl. Add the milk and egg, and whisk until smooth. Drain the boiled potatoes and return them to the pan. 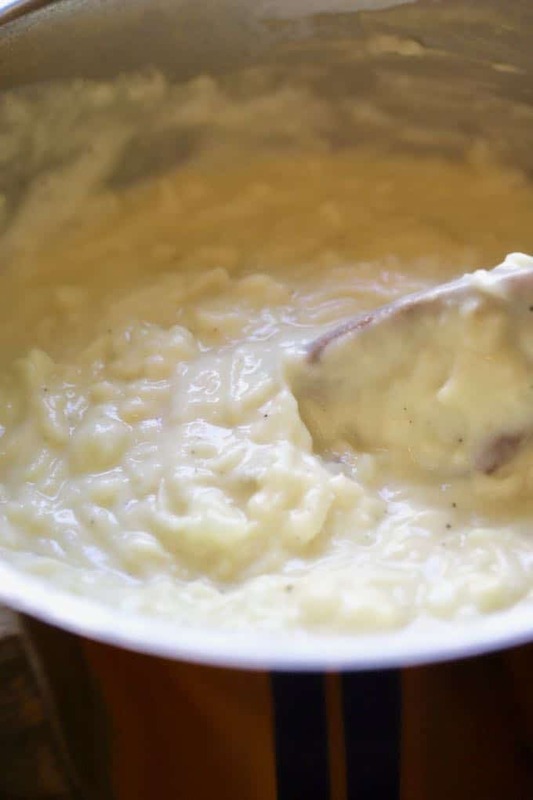 Add the half-and-half and 3 tablespoons of the butter and mash until the potatoes are smooth to make mashed potatoes. Set aside. Give the raw grated potatoes one final squeeze and then stir them into the mashed potatoes. Stir the potato mixture into the flour-milk mixture. Heat a 12-inch nonstick skillet over medium heat. Add one tablespoon of canola oil and one tablespoon of butter; heat until it begins to shimmer. 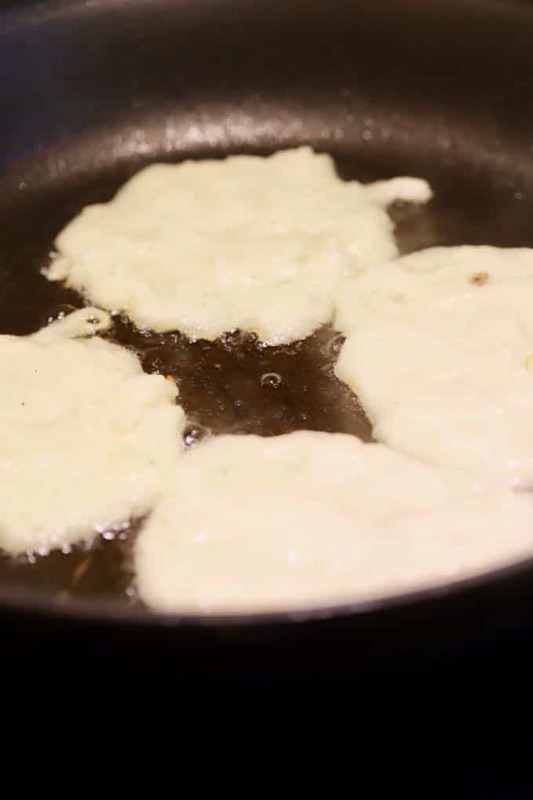 Working in batches, drop approximately 1/4 cup of the batter into the skillet and spread the batter into 1/4-inch-thick rounds. Cook until the Boxty bottoms are golden brown, 4 to 5 minutes. Flip and cook the other side until golden brown, about 3 minutes longer. Transfer to paper towel lined plate to drain, and then to the prepared baking sheet. Keep warm in the oven while you repeat batches with more oil, butter, and batter. Serve the Boxty warm, topped with a dollop of the sour cream and chive topping. nothing but happiness come through your door! If you prepare the recipe above, please consider rating it and leaving a comment below. Also, follow me on Pinterest, Facebook, and Instagram. And finally, to be the first to receive notifications of new posts by email, enter your email address in the Subscribe box. Thank you so much for visiting Grits and Pinecones! 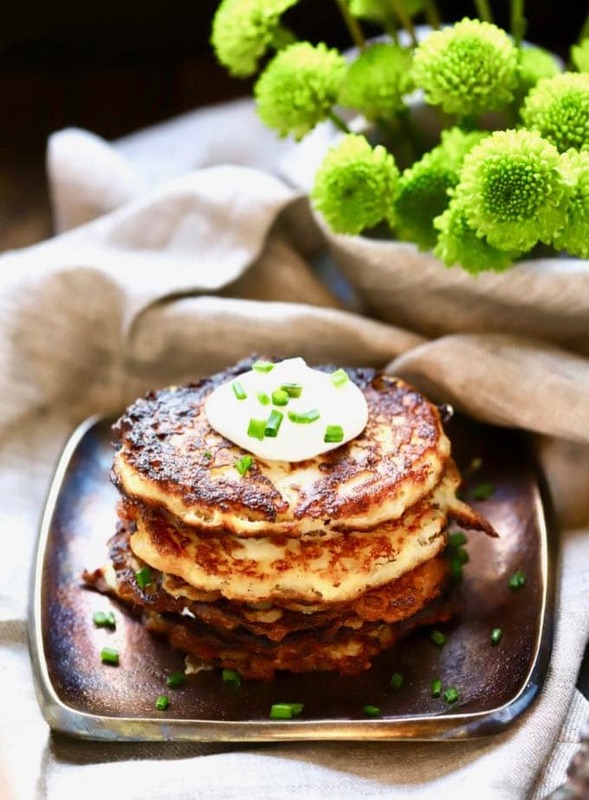 Celebrate St. Patrick's Day and put a smile on your face and a jig in your step with Traditional Irish Potato Boxty or potato cakes! 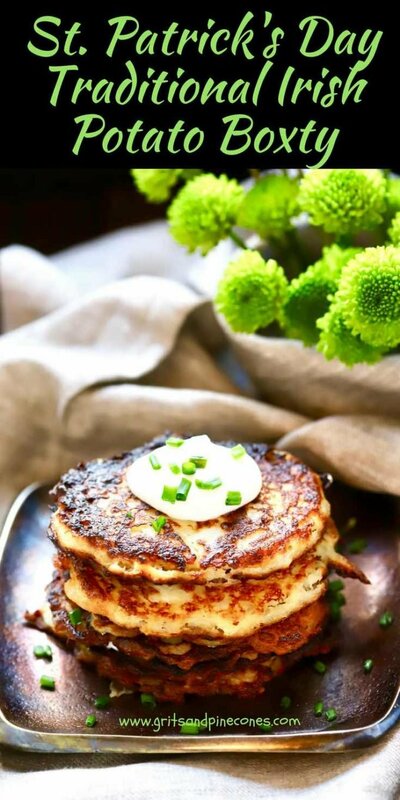 Boxty are delicious potato pancakes, crispy on the outside and soft and fluffy on the inside and made with a combination of mashed potatoes and raw grated potatoes. Whisk together the sour cream and chives in a small bowl. Set aside. Preheat the oven to 200° F. Put a wire rack on a baking sheet. Set aside. 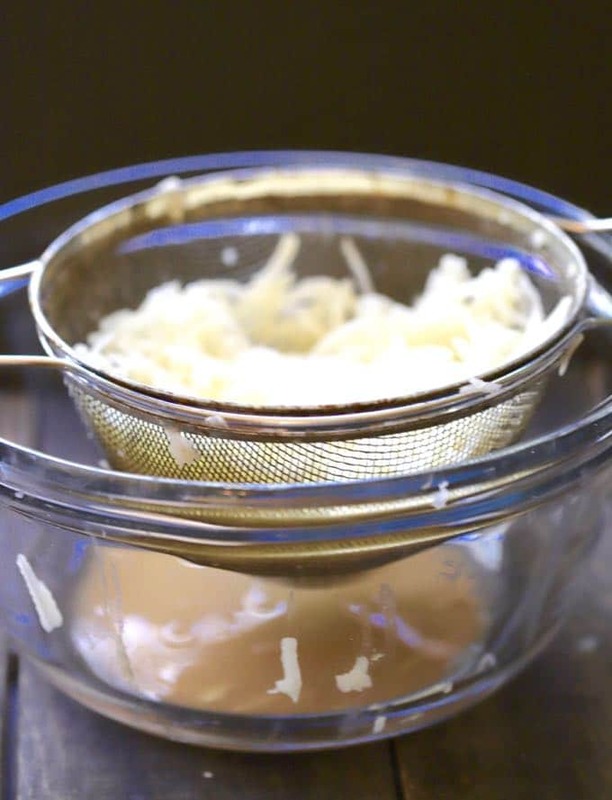 While the potatoes for the mashed potatoes are cooking, grate the remaining potatoes using a food processor or the large holes of a box grater. Transfer the grated potatoes to wire strainer set over a bowl. Toss with 1/4 teaspoon of salt and squeeze by hand to remove the liquid. 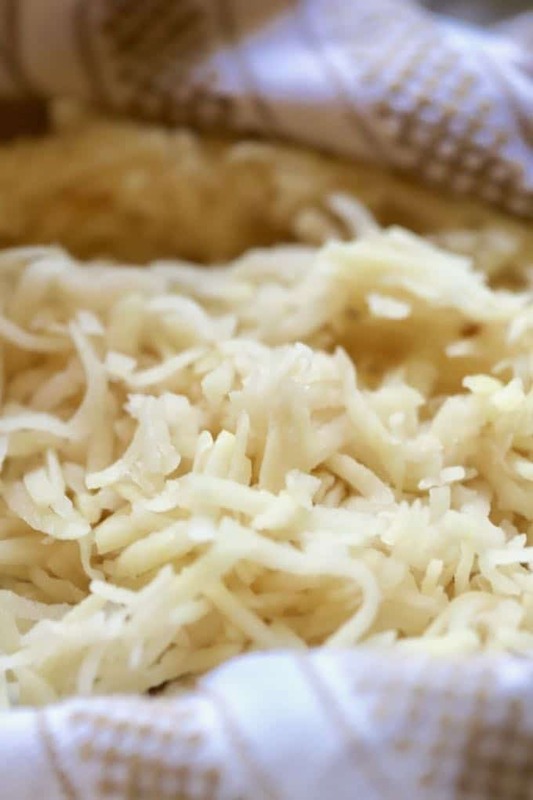 Wrap grated potatoes in a clean dish towel and squeeze to remove as much liquid as possible. Drain the boiled potatoes and return them to the pan. Add the half-and-half and 3 tablespoons of the butter and mash until the boiled potatoes are smooth. Give the grated potatoes one final squeeze and then stir them into the mashed potatoes. Stir the potato mixture into the flour-milk mixture. Heat a 12-inch nonstick skillet over medium heat. Add one tablespoon of canola oil and one tablespoon of butter; heat until it begins to shimmer. Working in batches, drop approximately 1/4 cup of the batter into the skillet and spread the batter into 1/4-inch-thick rounds. Cook until the Boxty bottoms are golden brown, 4 to 5 minutes. Flip and cook the other side until golden brown, about 3 minutes longer. Transfer to paper towel lined plate to drain, and then to the prepared baking sheet. Keep warm in the oven while you repeat batches with more oil, butter, and batter.